Son of a tobacco farmer-turned-coal-miner, Merle Travis spent most of his childhood in the small town of Ebenezer, living amongst conditions of extreme poverty. His father played the five-string banjo and for a while Merle also took up the instrument, but by the age of 12 he switched over to guitar after being presented a nondescript model by his brother. From some of his coal mining neighbors (one of whom was the father of two boys that later became known as The Everly Brothers) he learned a picking technique that used the thumb and two fingers to play bass and melody lines simultaneously - a technique that was responsible for much of his later fame, due to both the incredible technical prowess he achieved through its use and the varety of musical styles to which it could be applied. By his late teens Travis hit the road, busking around the country and eventually landing a job with The Tennessee Tomcats, followed by a period with the higher-profile group Clayton McMichen's Georgia Wildcats beginning in 1937. A year later he had secured a regular spot on WLW in Cincinnati as part of The Drifting Pioneers - an opportunity brought to an end by the outbreak of World War II, but as a result of which he managed to broaden his exposure to a national audience. At the same time as his membership in the Pioneers, Travis began collaborating with old-style banjo performer Grandpa Jones and The Delmore Brothers in a gospel group named The Brown's Ferry Four. By 1943 he and Jones were recording as The Shepherd Brothers for the King Records label, with whom Travis also produced solo material under the name Bob McCarthy. A brief period with the marines was soon followed by a move to Los Angeles, where he worked in a variety of country bands and even launched an acting career with roles in Westerns like The Old Texas Trail (1944) and Beyond the Pecos (1945). After making the acquaintance of Tex Ritter and securing a record deal with the newly-founded Capitol Records label, Travis' recording career finally began to make some progress: his first release No Vacancy b/w Cincinnati Lou scored reasonable success with both sides, and follow-up songs Divorce Me C.O.D., Missouri, and So Round, So Firm, So Fully Packed went even further, with So Round climbing to the number one position on the country charts. For Ritter he penned Smoke, Smoke, Smoke That Cigarette, which went on to become Capitol's first million-selling release. A less immediately popular venture was Folk Songs From The Hills, an 8-song collection themed around the plight of the coal mining community; while tracks such as Sixteen Tons and Dark as a Dungeon have since become classics, in the Cold War paranoia of the late 40s their worker-sympathetic themes were viewed by some government officials as subversive, Communist propaganda. Around 1948 Travis met machinist and instrument-maker Paul Bigsby, whose skills he enlisted to realize a design he had created for a solidbody electric guitar. The result later attracted the attention of guitar manufacturer Leo Fender, who adapted and simplified the design into what he called the Fender Broadcaster, issued in 1950 as the first commercially-available solidbody guitar. 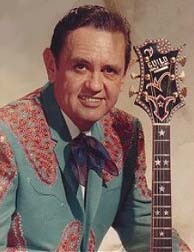 By this time Travis' time as a hit-making songwriter had more-or-less passed, and he turned his attention back towards his playing, taking a job as lead guitarist for Hank Thompson's Western Swing Band. Alcoholism was beginning to impact both his personal and professional life, but his career was far from over: in 1953 his film work reached its peak with an appearance in From Here To Eternity, and in 1955 Tennessee Ernie Ford turned his Commie anthem Sixteen Tons into a crossover hit. In the 1960s Travis moved his base of operations out of California, and for the first time began working in the 'country music capital' of Nashville, Tennessee. Aside from a second folk song collection, Songs of the Coal Mines in 1963, his recorded output focused primarily on instrumental material, showcasing a technical prowess on the guitar that remained undiminished through the years. Incidents of public drunkenness cast a pall over his reputation, however, and it wasn't until his collaborative record and tour with Chet Atkins in 1974 that he began to put his life back together. A significant comeback appeared to be on the horizon in the early 1980s, but a heart attack brought an end to Travis' life in October of 1983.